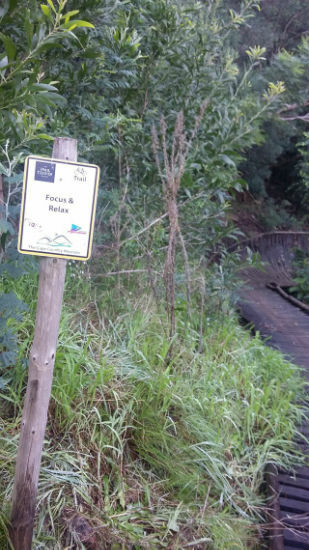 We decided to start our mountain bike day tour from Oak Valley then use the first cross over to gain access to the Paul Cluver mountain biking trail network. 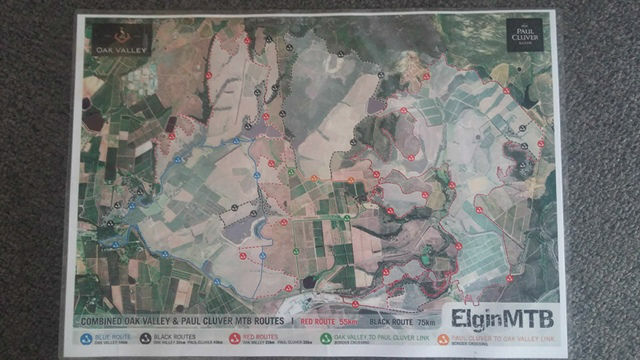 I had obtained a combined view map of both these fantastic bike parks and never thought we would have the adventure we did. Following the Oak Valley red route we jumped property and my excitement was at a high as I’d heard about this option but never got to doing it. We followed the link signage and then things went wrong. Remember we were following a map I had with me and what was on the ground, did not match my printed copy, disappointing is not the mention here. I wasn't impressed but decided to make the most and follow our original plan – Black Route and re enter Oak Valley. To cut a long story short, we found many junctions which differed to our map, and only two route colors and not three. Getting to the top of what was sign boarded as “Killi-2” we had one of these surprise junctions and no clue to where we should go, down in the distance we saw some awesome looking single track and our decision was made…...FOLLOW !!! This brought us to a section called “Poffadder Bridge” WOW….a wooden wine barrel burmed bridge across a small ravine, followed by some fantastic flowing single track and working our way back in the general direction we needed to head. 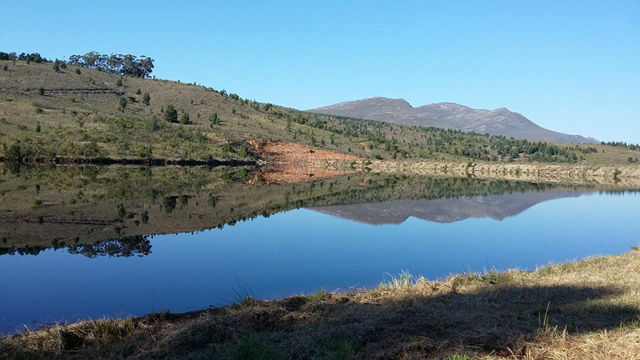 We hit a place called “Jackelsrivier Dam” and saw our Black Route again and followed this (remember our original plan), and again, had the best single trail to ride and followed by some more fancy berms. This brought us out at Gordon’s Kitchen, a farm stall on the Thandi property. Not really knowing where we where on our map we asked the manager, who himself didn't really know much but pointed us in the direction we wanted to go. We then cam to another mysterious multi crossing “Thandi 1St and 2nd Loop” and a jeep track heading our direction, we opted for the jeep track. 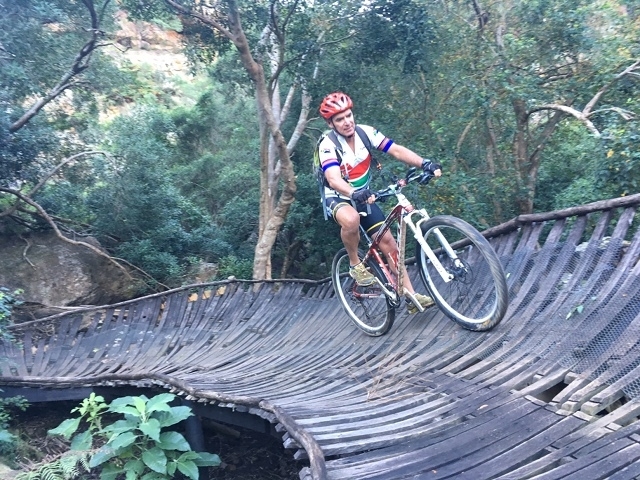 This was a lekker uphill and we then came to what must have been the top end of the Thandi 1st loop and decided to follow as it again was heading our direction. 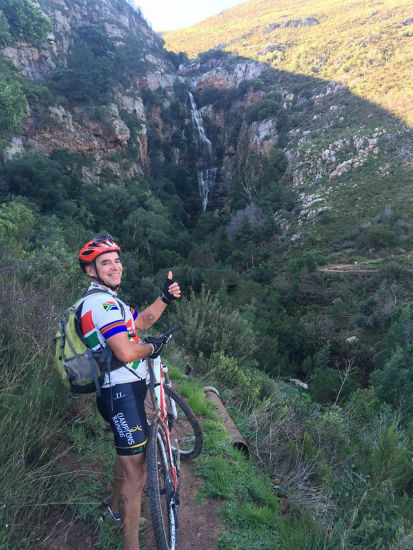 Coming to the eastern side of the Paul Cluver factory, the single track turned a sharp east and against our direction, we then decided to jump the fence and head back via the N2 towards Peregrine and back to Oak Valley. Writing this now, and having the correct map at hand, our taken route all makes sense and my desire to return and scout the many wooden bridges has motivated me to go back. What I have learnt is this, make sure you have enough OWN researched material and do not rely on others.